Dementia is a general term used to describe progressive and neurodegenerative diseases in which alterations in the chemical composition of the brain compromise one’s cognitive ability. Specifically, dementia is characterized by a decline in mental ability severe enough to interfere with everyday activities. Dementia is sometimes incorrectly referred to as “senility” or “senile dementia” reflecting the widespread but incorrect belief that dementia is a normal part of aging. At this time, there is no cure or remedy for any type of dementia, including Alzheimer’s disease. The only thing that existing medication can do is lessen symptoms and delay disease progression in some people and, in the interim, help support their mood and quality of life. 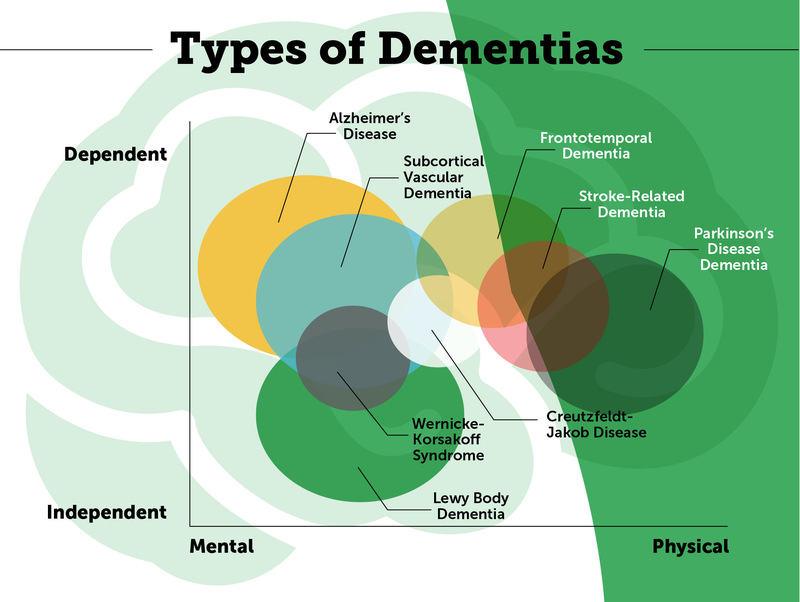 While these classifications are not always used, some physicians find it helpful to classify dementia into one of two groups, depending on the initial brain area that is primarily affected. There will typically be visible physical changes in the brain wherever the damage is, such as atrophy or shrinkage. The definition of cortical dementia is that it is a type of dementia that primarily targets the brain’s gray matter (in the cortex). Cortical dementia typically causes difficulties with language (such as word-finding or understanding others), social behaviors, and memory. Examples include Frontotemporal dementia, Creutzfeldt-Jakob disease, and Alzheimer’s disease. Subcortical dementia targets the parts of the brain underneath the cortex, and are linked to the white matter of the brain. Subcortical dementias are more likely to impact personality and thought processes. Language and memory tend to be largely unaffected in the early stages of these conditions. Parkinson’s, Huntington’s disease, and AIDS dementia complex are subcortical dementias. Typically, categorizing dementia as cortical or subcortical is of less value than determining the specific type of dementia someone is experiencing, as different types of dementia have unique symptoms, causes, and prognosis. Alzheimer’s disease is by far the most prevalent form of dementia, accounting for 60 to 80 % of all individuals with dementia. This chronic illness predominantly afflicts people in the 65+ age bracket, with the exception of “early onset” Alzheimer’s,rendering it the sixth leading cause of mortality in America. Almost 6 million people in the United States are estimated to have Alzheimer’s disease, and this number is expected to grow dramatically with the aging of our population. The first signs of Alzheimer’s disease include issues with memory, typically having difficulty recalling people’s names. These initial signs are commonly referred to as mild cognitive impairment (MCI). With Alzheimer’s, these symptoms progress to the point that the individual needs incrementally more assistance with everyday tasks and gradually becomes more dependent. Alzheimer’s disease is sometimes broken down into three stages: mild, moderate, and severe. Scientists are still working to determine exactly what causes Alzheimer’s disease. Like other types of dementia, Alzheimer’s seems to be brought on by progressive death of brain cells that happens over time, causing parts of the brain to shrink. Scientists also attribute Alzheimer’s disease to genetic mutations as well as environmental and lifestyle factors. 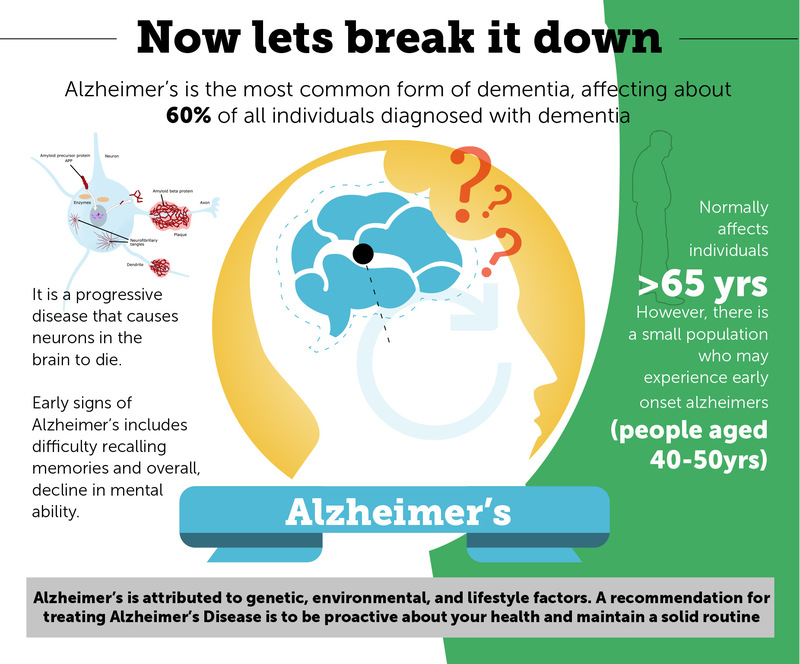 See our article on Alzheimer’s risks, causes, and prevention for more detailed information. Medications (such as Aricept) exist to reduce symptoms and delay the progression of the disease, however these medications are only effective in some people and for brief periods of time. Alzheimer’s is still a progressive disease and the person’s condition will worsen with time. On average, individuals with Alzheimer’s typically live between 4 and 8 years with the disease, but some can live as long as 20 years. Vascular dementia, usually results from a succession of small strokes, is also referred to as a post-stroke or multi-infarct dementia. It ranks only second to AD as the most prevalent dementia, accounting for approximately 10% of all dementia cases. Strokes can cause a weakening of the blood flow to the brain, which in turn brings about confusion and the failure to think or speak clearly. When the brain is starved of oxygen and nutrients, brain cells start to weaken and die. Like Alzheimer’s, vascular dementia symptoms can vary across a wide range and depend largely on how bad the blood vessel damage is and what portion of the brain is impacted. After a stroke, patients can experience symptoms like confusion, difficulty speaking, disorientation, and the inability to focus. Compared to Alzheimer’s, vascular dementia primarily affects judgment or ability to make decisions, as opposed to memory. Following one or more strokes, vascular dementia may also be characterized by physical symptoms like vision or speech problems and weakness in limbs, but these symptoms might get better with rehabilitation. Vascular dementia is primarily caused by strokes, causing the brain to go without nutrients for an extended period of time. When this blockage occurs, it leaves the brain partially or severely damaged. Another cause is the constricting of blood vessels or the prevalence of damaged blood cells. Those with heart conditions, Diabetes, high blood pressure, or high cholesterol may be at greater risk of developing vascular dementia. There are currently no approved drugs for the treatment of vascular dementia. There is, however, some evidence that certain drugs used to treat the symptoms of Alzheimer’s disease may provide some benefit to those with vascular dementia. The most important thing you can do for now is control the risk factors that contributed to the dementia in the first place (e.g. blood pressure or cholesterol levels). Individuals with vascular dementia live for about 5 years on average after their symptoms begin. Click here for more information on vascular dementia. 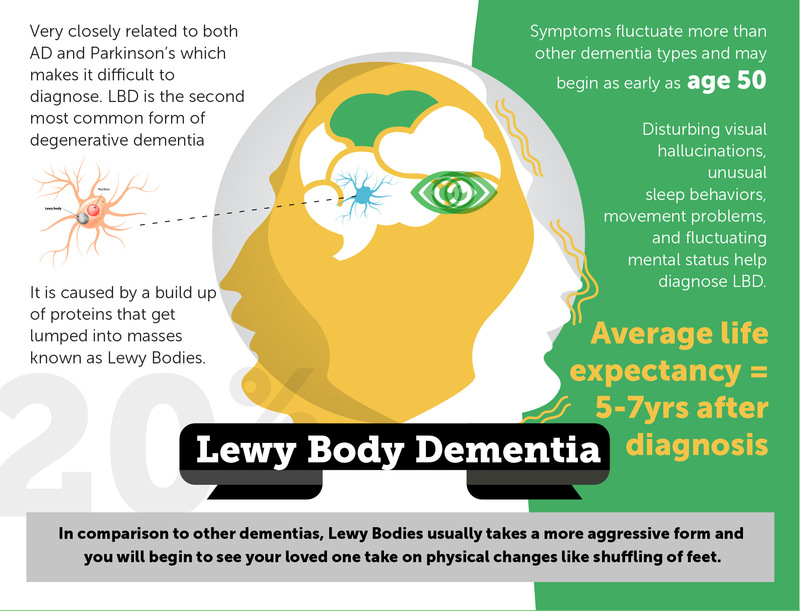 Dementia with Lewy Body (LBD) is the third most prevalent type of dementia, after Alzheimer’s and vascular dementia. Individuals with LBD experience both deficits in their memory and difficulty thinking. At first, the LBD symptoms look similar to Alzheimer’s. As LBD progresses, the disease acquires its own set of symptoms, notably a blank facial expression, tremors, difficulties walking and hallucinations. Symptoms of LBD worsen over time and include memory loss, difficulty planning and executing functions, paying attention, and making decisions, and problems completing and following through on routines. Difficulties with visual perception and visual hallucinations are also common, as are concentration difficulties, restlessness, sleeplessness, and spontaneous, Parkinson’s-like tremors. Individuals with LBD may also experience depression and/or apathy, or loss of motivation. LBD is caused by an abnormal buildup of proteins called alpha-synuclein that get lumped into clusters known as Lewy Bodies and affect chemicals in the brain. People with LBD have plaques and tangles, associated with Alzheimer’s disease, in their brains as well. In LBD, the part of the brain that is affected the most is the center cortex, associated with thinking, memory, and movement. Though there is currently no cure for LBD, existing medications can help manage some symptoms of the disease. These medications are called cholinesterase inhibitors (used to treat AD) and they can help if a person with LBD is experiencing memory problems. Examples of these medications include Donepezil, Rivastigmine and Galantamine. If a person with LBD has movement problems, medications used for Parkinson’s disease, such as Levodopa (L-dopa), may be recommended. Sleep problems can also be managed by sleep medications including melatonin. The disease lasts an average of 5 to 7 years from the time of diagnosis to death, but depending on the person, it can last anywhere from 2 to 20 years. Mixed dementia is a term used when Alzheimer’s and other dementias co-exist in the same person. In the most common type of mixed dementia, the protein deposits linked to Alzheimer’s disease co-exist with the blood vessel problems associated with vascular dementia. Alzheimer’s disease also is likely to co-exist with Lewy Body Dementia. In some cases, a person might display brain changes characteristic of all 3 types of dementia. It is not known how many people have mixed dementia, as it may often be misdiagnosed as a single type, but autopsies suggest that the condition may be much more prevalent than previously thought. Symptoms of mixed dementia likely vary, as they will depend on the changes in the brain and the brain regions that are affected. Symptoms in many cases resemble Alzheimer’s disease or another type of dementia. In other cases, a person’s symptoms might more clearly suggest that they are experiencing more than one type of dementia. 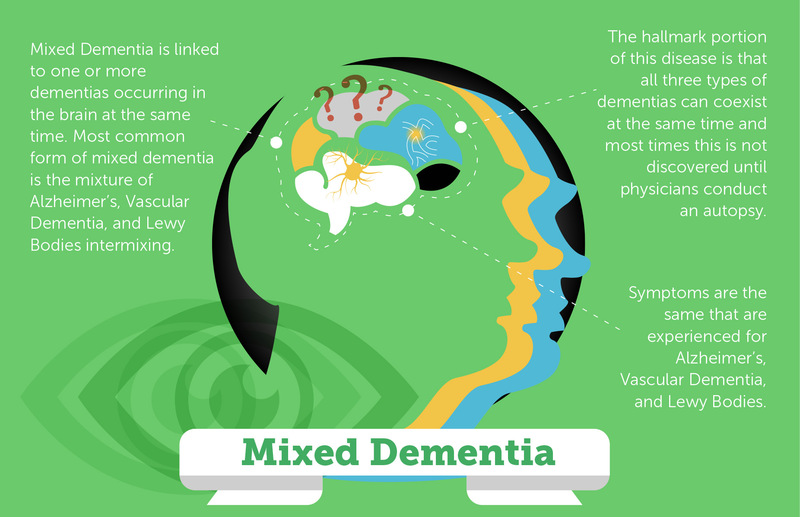 The causes of mixed dementia depend on the mix of symptoms they are experiencing. In most cases, mixed dementia seems to be caused by the abnormal protein build up linked to Alzheimer’s disease in addition to blood vessel linked to vascular dementia. It is not known why some individuals experience more than one type of dementia, but it is thought that those with more than one type may experience worse brain damage. As most people with mixed dementia are mistakenly diagnosed with a single type of dementia, physicians often prescribe medication based on the type of dementia that’s been diagnosed. No medications are approved by the U.S. Food and Drug Administration (FDA) to treat mixed dementia specifically. However, if your loved one is experiencing symptoms that most resemble Alzheimer’s disease, Alzheimer’s medications may provide some help with some of their symptoms. 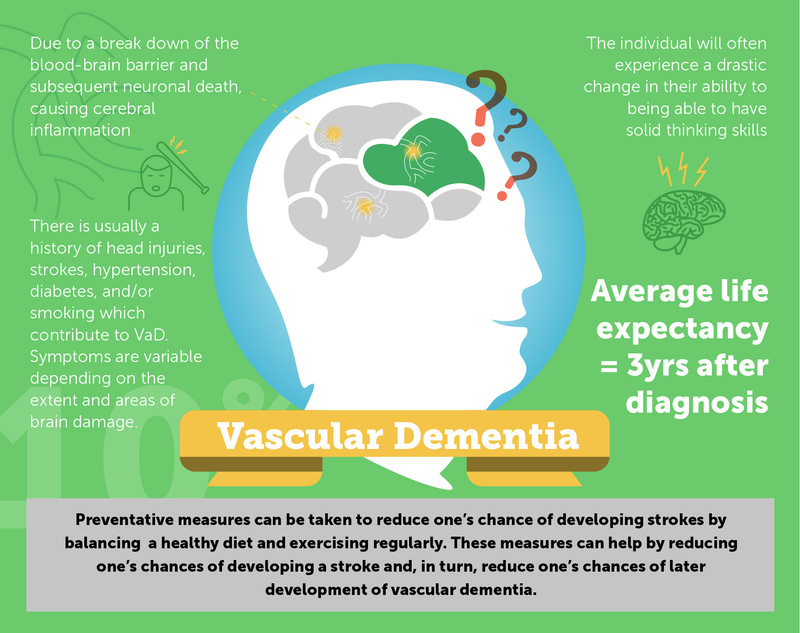 As vascular dementia is one of the most common co-occurring forms of dementia, it cannot hurt to control vascular risk factors like high blood pressure and cholesterol. It is hard to provide a disease duration for mixed dementias as experiences can vary a great deal depending on the unique combination of diseases, as well as age and coexisting health conditions. An estimated 50 to 80 percent of those with Parkinson’s eventually develop dementia as their disease worsens. The average duration of time from a Parkinson’s diagnosis to the development of dementia is about 10 years. Some factors at the time of a Parkinson’s diagnosis might increase individuals’ likelihood of developing dementia, including older age, more severe motor symptoms, and mild cognitive impairment (MCI). People may also be more at risk if they experience hallucinations, excessive daytime drowsiness, and Parkinson’s symptoms of postural instability and gait disturbance, which can include freezing mid-step, shuffling the feet, and problems with balance and falls. There are currently no treatments to slow or stop the cognitive decline caused by Parkinson’s disease dementia. Current strategies focus on helping with certain symptoms. Potentially useful medications include cholinesterase inhibitors (the main Alzheimer’s treatment), antipsychotics, L-Dopa, anti-depressants, or clonazepam (to treat REM sleep disorder). Like other types of dementia, Parkinson’s disease dementia gets progressively worse with time, though the rate of progression can vary from person to person. 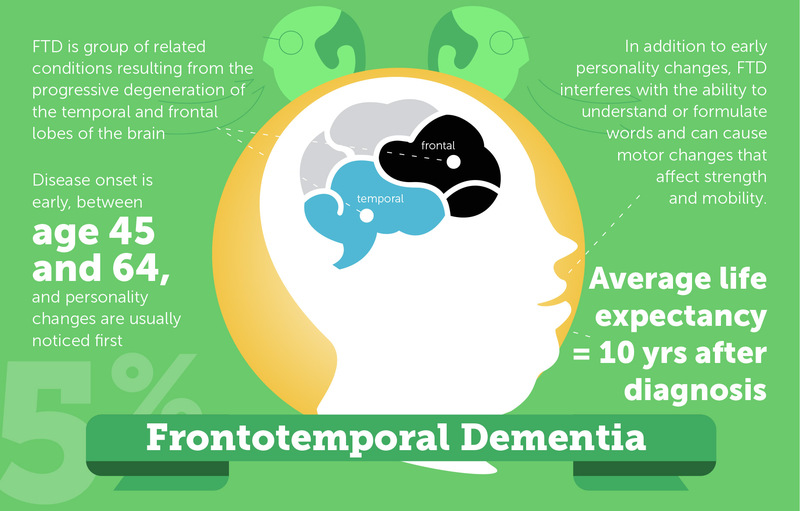 Frontotemporal dementia involves a diverse group of uncommon disorders that directly affect the frontal temporal lobes of the brain. As a result, one’s personality, behavior, and language begin to show radical decline. The brain typically shrinks due to atrophy. Typically, people are diagnosed with Frontotemporal dementia when they are in their 40’s, much earlier than Alzheimer’s disease is usually diagnosed. In FTD, the frontal and temporal lobes of the brain atrophy or shrink. 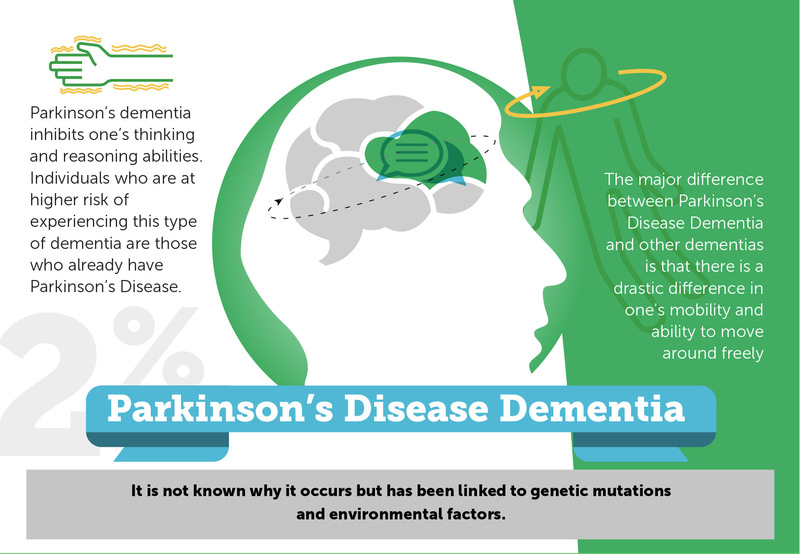 Some genetic mutations have also been linked to certain subtypes of frontotemporal dementia. However, more than 50% of those who develop frontotemporal dementia have no family history of the disease. In some cases, the disease seems to result from pick cells or pick bodies that develop inside the nerve cells in the brain. These cells have an abnormal amount of a protein known as Tau. There are no known risk factors for FTD other than a family history of dementia. Like Alzheimer’s and other types of dementia, there is no cure for frontotemporal dementia. There are also no treatments to slow down the progression of FTD. There are medications that might help ease behavioral symptoms like irritability, depression, and agitation. The speed of decline will vary, but symptoms of FTD tend to progress at a rapid, steady rate. Individuals with frontotemporal dementia can survive anywhere between 2 and 15 years with the disease. See our article on FTD for more information. 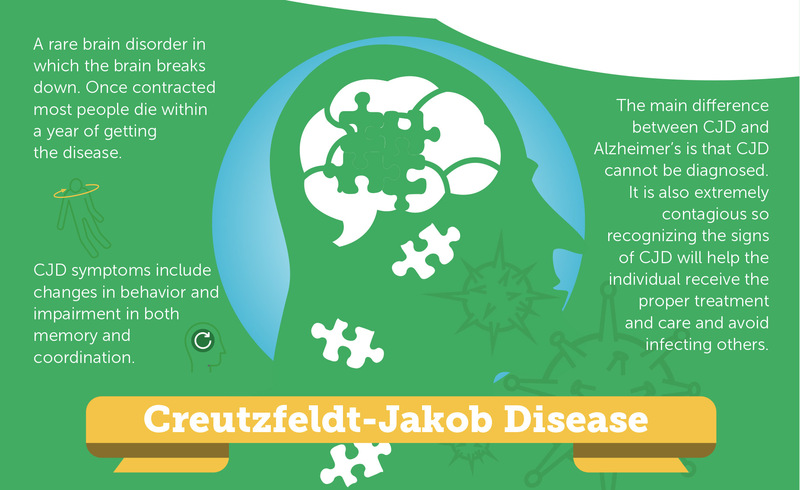 Creutzfeldt-Jakob Disease is an extremely rare brain disorder in which the brain breaks down. Once contracted, usually around age 60, most people die within a year. The disease destroys brain cells, and then begins to look like a sponge. It affects approximately one person out of every one million people per year worldwide, with about 300 cases per year in the U.S. In the early stages of the disease, individuals experience failing memory, behavioral changes, poor coordination and visual impairment. People with CJD may also experience insomnia, depression, or unusual sensations. As it progresses, individuals may experience worsened mental deterioration, involuntary or jerky movements, muscle weakness, blindness, and coma. Pneumonia and other infections often occur in the later stages of the disease and can lead to death. Causes for this type of dementia have yet to be discovered. What is known is that the disease begins when prion proteins begin to accumulate in the brain and then begin to mutate. Familial CJD results from prion protein genes that guarantee that an individual will develop CJD. Since there is no cure for CJD, current treatment focuses on alleviating symptoms and making the individual as comfortable as possible. Opiate drugs can help provide pain relief, and the drugs clonazepam and sodium valproate may help relieve myoclonus. Towards the end of the disease, changing the person’s position frequently can keep him or her comfortable and prevent bedsores. Catheters can be used to drain urine if the individual cannot control bladder function, and intravenous fluids and artificial feeding can also be used. 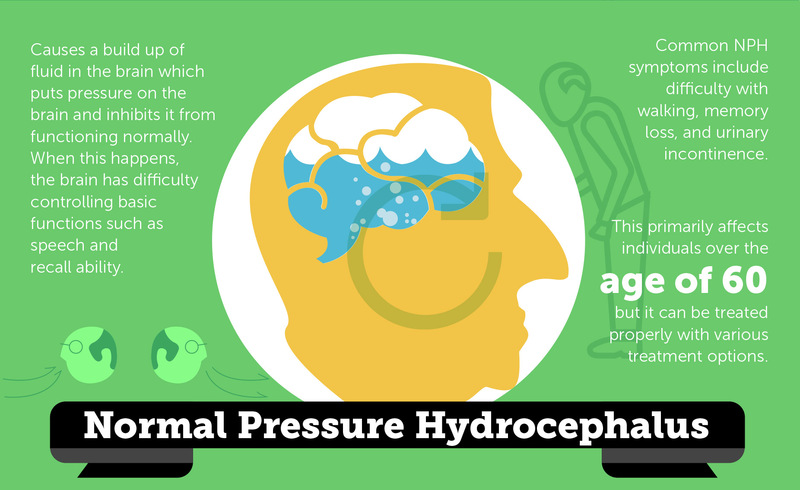 Normal-Pressure Hydrocephalus is a condition that is characterized by abnormal buildup of fluid in the brain. In a healthy being, the cerebrospinal fluid (CSF) is able to circulate around the brain and the spinal cord. Those with NPH have an abnormal build-up of CSF in the brain’s cavities, causing the ventricles to enlarge and putting pressure on the brain. When this happens, the brain has difficulty controlling basic function such as speaking and memory. NPH primarily affects individuals over age 60. Signs and symptoms for this condition include those that are typical only of NPH patients. Frequent urination, gait disturbance, and mild dementia are among those. Individuals with NPH also feel like their feet are glued to the floor, causing difficulty with walking. This is different from Parkinson’s in which the individual will likely experience tremors. Also, in comparison to Alzheimer’s disease, individuals with NPH will not have memory loss or confusion until the later stages. Normal-Pressure Hydrocephalus (NPH) can develop after a stroke, head injury, brain surgery, meningitis, or any disorder that causes bleeding around the brain. It can also be caused by a brain tumor. For some people, the cause remains unknown. Unlike other forms of dementia, there are some effective treatments for NPH. The most common option is the surgical implantation of a shunt, which is a tube placed in the brain to divert the flow of cerebral spinal fluid (CSF) into another part of the body where it can be absorbed. A valve within the shunt keeps the CSF at normal levels and pressure. Clinical trials are also exploring alternative treatments, such as endoscopic third ventriculostomy. Typically, early diagnosis and treatment lead to the best chance of recovery, but this does not mean that individuals who have had symptoms for years can’t improve with treatment. 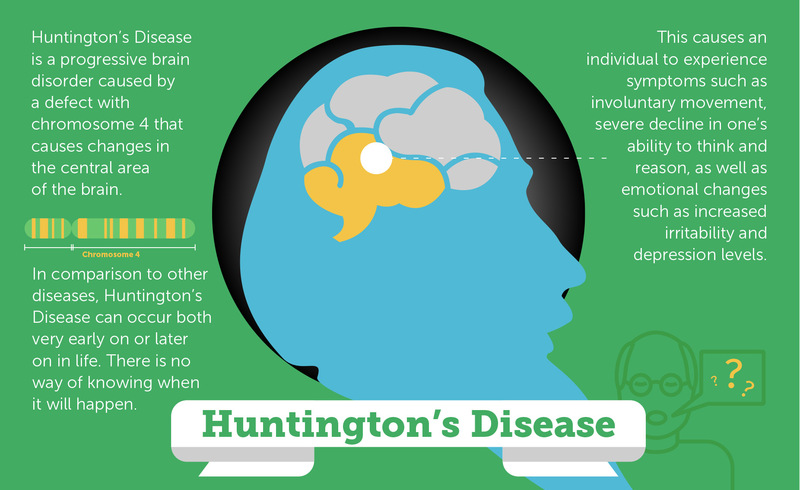 Huntington’s disease is a progressive brain disorder that is caused by a defective gene that causes changes in the central area of the brain which can affect one’s motor abilities, thinking, and mood. Huntington’s disease affects approximately 3 to 7 per 100,000 people. Huntington’s disease primarily affects individuals who are of European descent. Huntington’s disease usually arises in individuals between ages 30 to 50. The first sign that someone has Huntington’s disease is that they will experience uncontrollable movement of the body and a decline in their ability to reason and organize events. Huntington’s disease can also cause an individual to experience changes in mood and heightened depression. The cause of Huntington’s is a defect in a small section of chromosome 4. Genetic testing can be done to see if someone is at risk of getting the disease. Huntington’s is sometimes regarded as the quintessential family disease because every person with a parent who has HD has a 50/50 chance of carrying the gene. Researchers have not yet found a cure for HD or a treatment that really stops its progression. However, there are treatments that can help people manage their symptoms, including movement, cognitive, and psychiatric problems. Xenazine is the first medication approved by the FDA to treat Huntington’s, and it can help suppress involuntary muscle movements (jerks), however it can also have serious side effects. Anti-psychotics, physical therapy, occupational therapy, and speech therapy can also help. 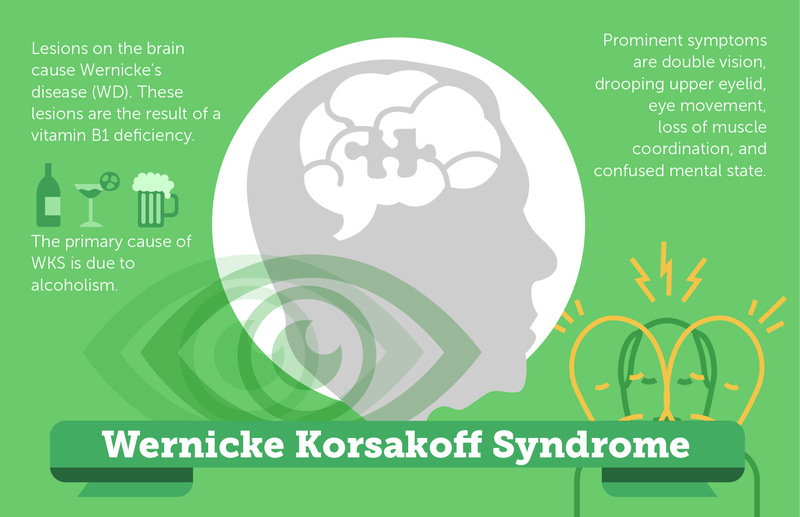 Wernicke-Korsakoff syndrome, or Wet Brain Syndrome, is a brain disorder that is primarily due to B-1 deficiency. There are 2 stages of WKS. In the first stage, Wernicke encephalopathy is acute and damages both the thalamus and the hypothalamus regions of the brain. If treated with the right care, the damage can be reversed. The second stage is Korsakoff psychosis, known as a chronic brain damage, and it is the symptomatic response for this part of the disease. This occurs when the disease is not treated appropriately. The primary cause of WKS is chronic alcohol abuse. There are other less common causes such as conditions that limit nutritional absorption, gastric bypass surgery, eating disorders or hunger strikes, and colon cancer, which can create pain and cause one to avoid eating. Recent research suggests that ApoE4, a gene linked to Alzheimer’s, may also be associated with a higher risk of WKS in individuals who drink heavily. If the condition is diagnosed early and the person stops drinking, treatment with high-dose thiamine may reverse some, but usually not all, damage. In later stages, treatment can stop progression of the deterioration but may not reverse it. A history of WKS also increases susceptibility to any future brain decline and raises the likelihood of developing dementia at a later time. Fortunately, WKS has become less common since foods have been supplemented with B vitamins. 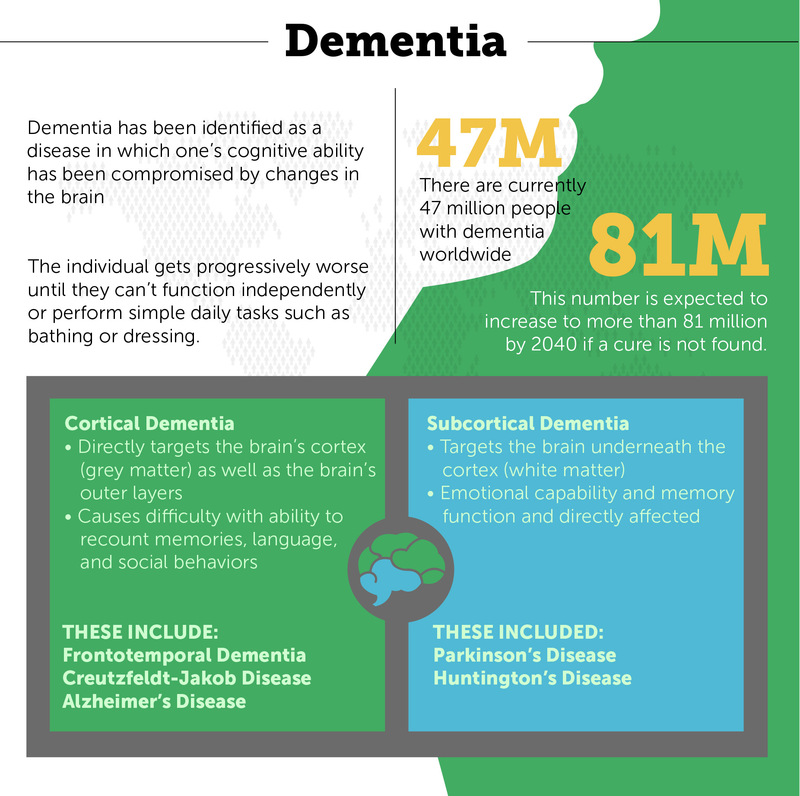 Hopefully this article has provided you with a useful overview on the various types of dementia. Dementia is a difficult disease – both for individuals diagnosed and their loved ones. If armed with the right information and knowledge about the disease and the necessary tools and support, the experience of dementia can be manageable. Globally, approximately 50 million people have some type of dementia, so you and your loved ones are not in this alone.